In a shocking news, it has alleged that there has been a threat to Congress President Rahul Gandhi’s life in Uttar Pradesh's Amethi town. 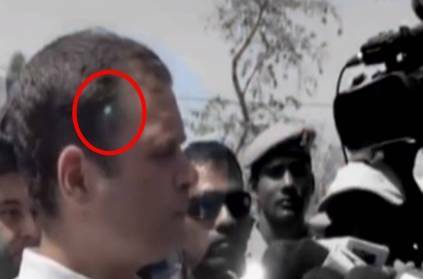 The Congress Party has written to the Ministry of Home Affairs with regard to this matter and said that during his media interaction, a laser was pointed at his head, which could have come from a sniper rifle. Soon after the incident, the Congress Party demanded the Centre to investigate the matter and neutralize the threat. They further claimed that a green laser was pointed seven times at Rahul's head. According to NDTV, this sensational incident happened yesterday after Rahul Gandhi filed his nomination papers from Amethi for the Lok Sabha elections 2019. Soon after the incident, the Congress Party demanded the Centre to investigate the matter and neutralize the threat. It is noteworthy that, Rahul Gandhi's father and grandmother, former Prime Ministers Rajiv Gandhi and Indira Gandhi, were assassinated. Today the first phase of Lok Sabha poll started at 7:00 am with voters in 91 constituencies across 18 states and 2 Union Territories exercising their franchise to decide the fate of 1279 candidates. 'அப்படி என்ன கேட்டார் அவர்'?... 'ராகுல் காந்தி'க்கு குவியும் பாராட்டுகள்...வைரலாகும் வீடியோ! அட இங்கையும் பிரச்சாரமா? தனி ஸ்டைலில் பிரச்சாரம் செய்யும் பிரியங்கா காந்தி! காங்கிரஸ் ஜெயித்தால்! பாகிஸ்தானுக்கு தீபாவளி பாஜக மூத்த தலைவர் சர்ச்சைப் பேச்சு! காங்கிரஸ் கட்சியின் வேட்பாளர் பட்டியல் வெளியிடு! இழுபறியில் சிவகங்கை! This page contains news relating to various facts and events. The views are generally about current affiars and general topics in diversified areas such as political, international, national, and regional issues, sports, health, travel, lifestyle, technology and business. People having similar interets on the above topics will find this page useful. Threat to Rahul Gandhi in Amethi as laser, possibly from sniper gun, p | India News.